This isn’t your stock 3 x 12 bodybuilding split photocopied out of your latest muscle mag. 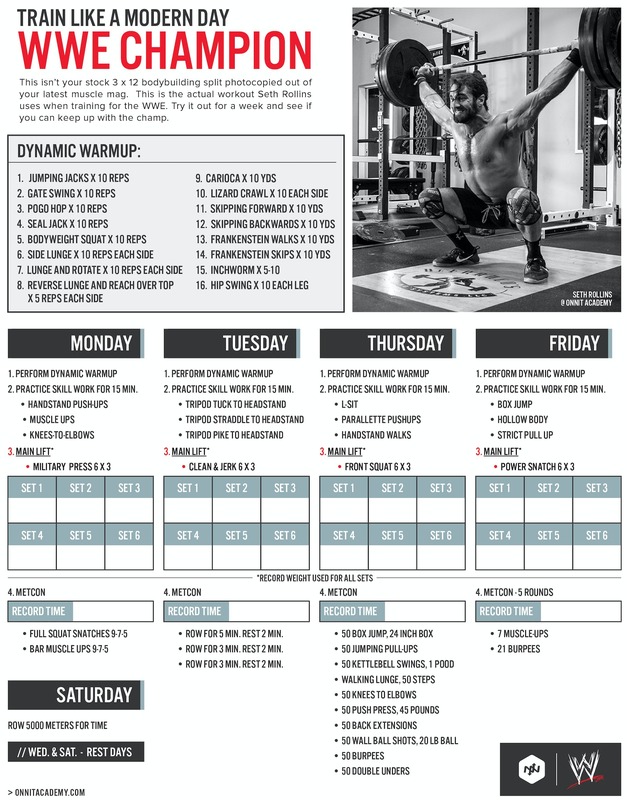 This is the actual Seth Rollins workout he uses when training for the WWE. Try it out for a week and see if you can keep up with the champ. 2. PRACTICE SKILL WORK FOR 15 MIN. • ROW FOR 5 MIN. REST 2 MIN. • ROW FOR 3 MIN. REST 2 MIN. Pretty impressive … but who has the time to do it? Seth does it for a living, but for those doing something else for a living, it’s rough. These are pretty much average crossfit workouts. There’s list of people doing these types of workouts every day with regular jobs. I would imagine Seth has far less free time than an average person. you gotta realize that Seth has way less time than the average person, as well… on the road 300 days a year, town-to-town, hopping from (usually) breakfast -> gym -> arena -> late night dinner -> next town, arriving in the early morning and then having to do it all over again. He makes time just like anyone else who works out does. Im always very impressed with Seth Rollins workout schedule; of coruse as a beginner I would go one set at a time to reach Seths’ maxium superhuman status; I’m training step by step now, Thanks to Seth Rollins passion for CrossFit.